27" iMac Display Fixed, originally uploaded by hochit. What a coincident! I just got a very great AppleCare experience today. 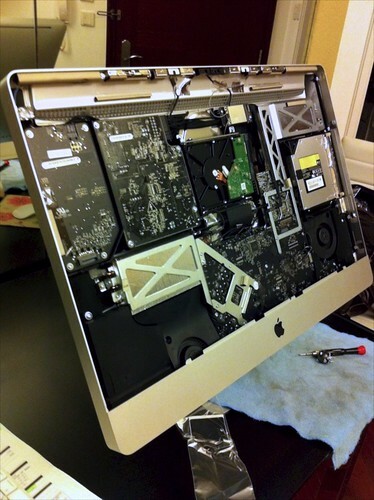 And the same time Ken Rockwell posted his blog about upgrade his Mac. Some friends heard my MacBook Pro was dead again and again and started asking me whether Mac is still good for me. I told them I must get trouble 10 times if I use Windows. Just in this week without my Mac, I tried to use Windows 7 and got so many troubles! If you say my PC is too old for Windows 7, then what’s the point of saving the money for buying a PC? My computers serve me. Sadly too many people are slaves to servicing Windows. I spent more time writing about my trivially pleasant experience this morning than it took me to upgrade. Why do I write this stuff? Because I feel sorry for people who think they’re saving $50 by buying new crappy Dells, Vaios, and whatevers and then spend $300 in later upgrades to get what a Mac would have done right out of the box, and still have to deal with viruses, backtalk from their computers and all the crap they take for granted, when simply buying a Mac instead next time will let you get your work done, and enjoy it. Thx CASE, my last 2 experience are quite nice. I hope they can regain confidence from Apple users in Hong Kong. Btw, I hope their page can look nicer.